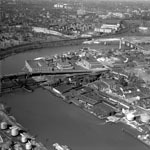 The Gray’s Ferry area of Philadelphia underwent an astonishing transformation in the span of one hundred years. From the ca. 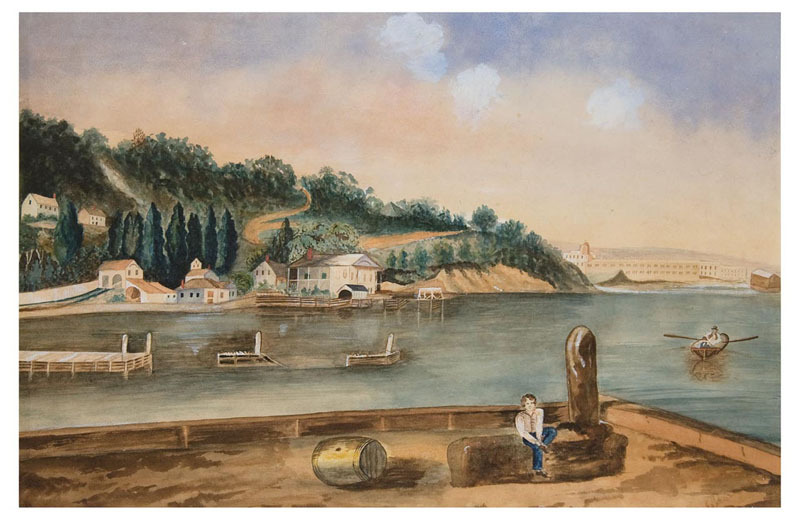 1835 watercolor purchased at the Snider saledepicting a quiet relatively rural scene to a 1940 view of an industrial area crammed with factories, smokestacks, and water towers, only the curve of the Schuylkill River remained the same. P. Clark. [Schuylkill River at Gray’s Ferry], ca. 1835. Watercolor and gouache on paper. Acquired from the Jay T. Snider Collection. This view along the lower Schuylkill River shows the still bucolic nature of much of the region only a few miles from the commercial and residential center of the city. 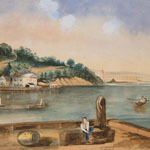 The area drew revelers who enjoyed Gray’s amusement garden, and the scenery attracted artists including William Strickland, whose 1811 image entitled View of Gray’s Ferry Cliff looking up the Schuylkill may have been done from a vantage point similar to P. Clark’s watercolor.Clark, whose identity remains a mystery, incorporates a number of significant structures in his watercolor, including the floating bridge in the foreground, the Kochersperger family home and nearby hotel at the water’s edge in the center, and the large two-story building in the background, possibly the newly constructed Naval Asylum. Aero Service Corporation. 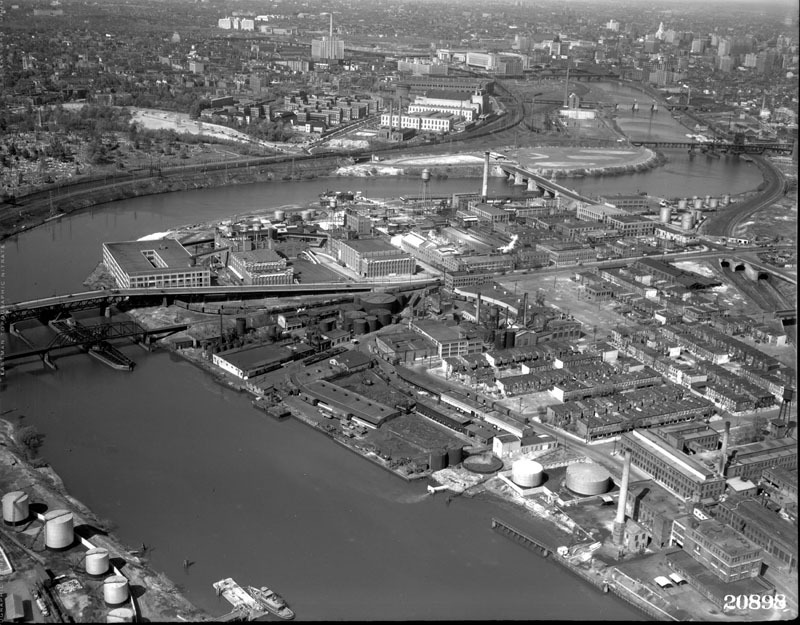 [Allied Chemical & Dye Corporation Plant], 1940. Modern reproduction from original negative. Gift of Virgil Kauffman. “With the river banks and bottom foul with deposited sewage; with sewage in suspension and visibly floating upon the surface of the stream, and with the blood and offal of slaughter houses and the waste of oil refineries, chemical factories and paint works, the conditions [of the Schuylkill River] are impossible to overstate,” declared John Frederick Lewis in a 1924 speech, “The Redemption of the Lower Schuylkill.” This aerial photograph showing a view up the Schuylkill from just below Gray’s Ferry Bridge captures the environmentally unfriendly industrial character of the area. Robert Newell. Gray’s Ferry Inn, ca. 1870. Modern reproduction of photograph in album. Gift of S. Marguerite Brenner. 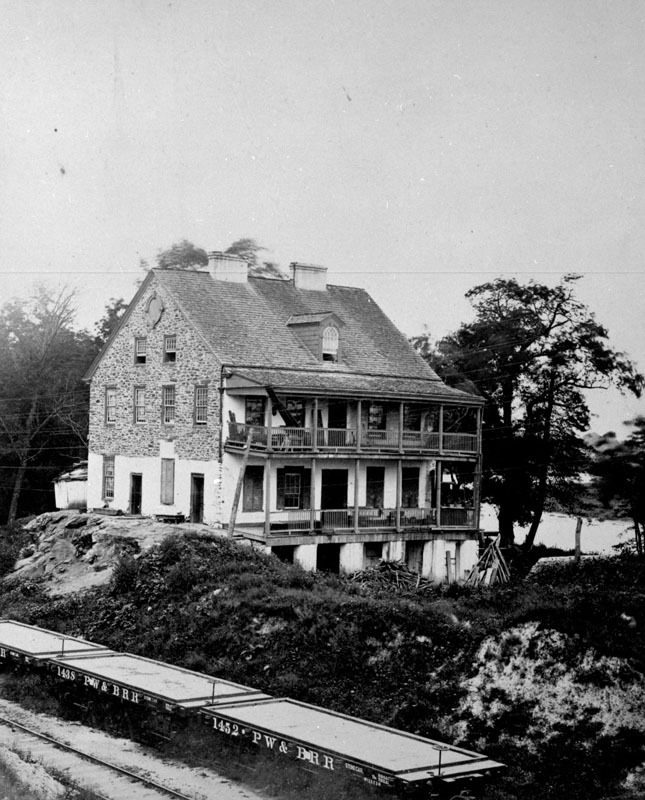 The dilapidated innkeeper’s house for the Kochersperger’s Hotel (also known as Gray’s Ferry Inn) still stood when Philadelphia commercial photographer Robert Newell (1822-1897) took this view ca. 1870. The Philadelphia, Wilmington & Baltimore Railroad freight cars in the foreground give an indication of the changing nature of the area. 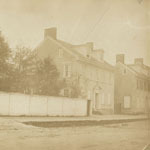 This photograph served as the basis for a watercolor of the innkeeper’s house by Benjamin Evans, also in the Library Company’s collection. 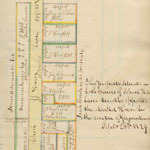 William Green’s early-19th-century manuscript journal enhances the Library Company’s important collection of photographs, prints, and ephemeral material visualizing the Germantown section of the city, which contained the first paper mill in North America and the premier printing shop of Christopher Saur. William Green. Manuscript journal, [ca. 1828-ca. 1880s]. Acquired from the Jay T. Snider Collection. This journal containing a hodgepodge of entries from the 1820s to the 1830s reflects the daily life of its creator, civic-minded Germantown Academy teacher William Green. 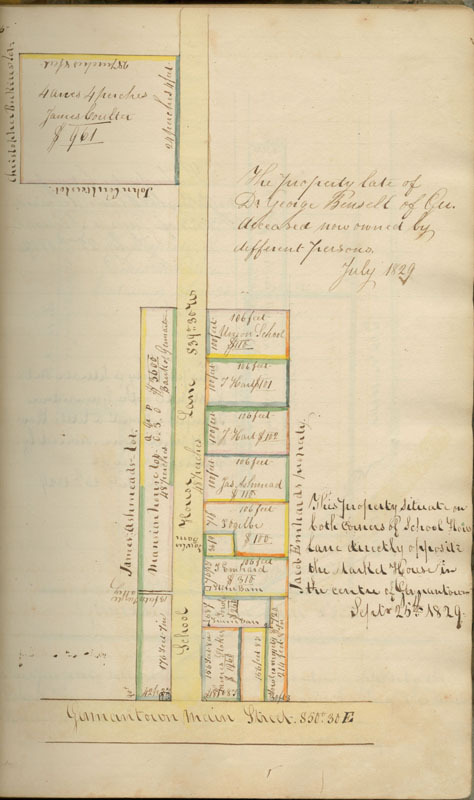 Although surveys of Germantown properties, such as the area near the 5500 block of Germantown Avenue displayed here, garner several pages, the volume also contains lesson plans, transcriptions of legal documents, remarks about current and community events, and personal notes about Green’s daily activities. 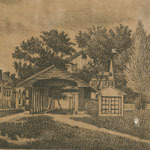 This drawing, created from surveys taken soon after the death of George Bensell (1759-1827) and the disposal of the lots, depicts the block across from the Market Square that also contained the property of the Ashmeads, a long-established Germantown family. Green was a friend of Charles F. Ashmead (1808?-1866), a fellow parishioner at the Methodist Meeting House. Surveys near Germantown Academy, the Methodist church, and other properties of personal significance to Green fill the pages as well. Detail from No. 11 published in Atlas of (The Late Borough of) Germantown, Twenty-Second Ward, City of Philadelphia (Philadelphia: Surveyed, Compiled, Drawn and Published under the direction of G. M. Hopkins, C.E., 1871). Modern reproduction. 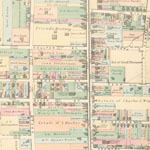 From the 1870s to the 1930s map publishers issued ward atlases of Philadelphia to inform the public about the development and real estate value of sections of the city. The upper right corner of this reproduction shows the same area as surveyed by Green. The Ashmead family still retains plots of land across from the Market Square. A little farther south and on the adjacent block is the footprint of the residence of businessman and philanthropist Elliston P. Morris (1831-1914). Elliston’s son, Marriott C. Morris (1863-1948), like Green, also felt compelled to personally document his neighborhood, albeit by camera rather than drawing pen. John Richards. Market square. (Philadelphia, ca. 1863-ca. 1888). Zincograph. Gift of David Doret. From the 1860s to the 1880s, Civil War veteran and Germantown resident John Richards (d. 1889) completed a series of drawings of old Germantown landmarks that included this view of nearly the same area surveyed by our journal keeper William Green. 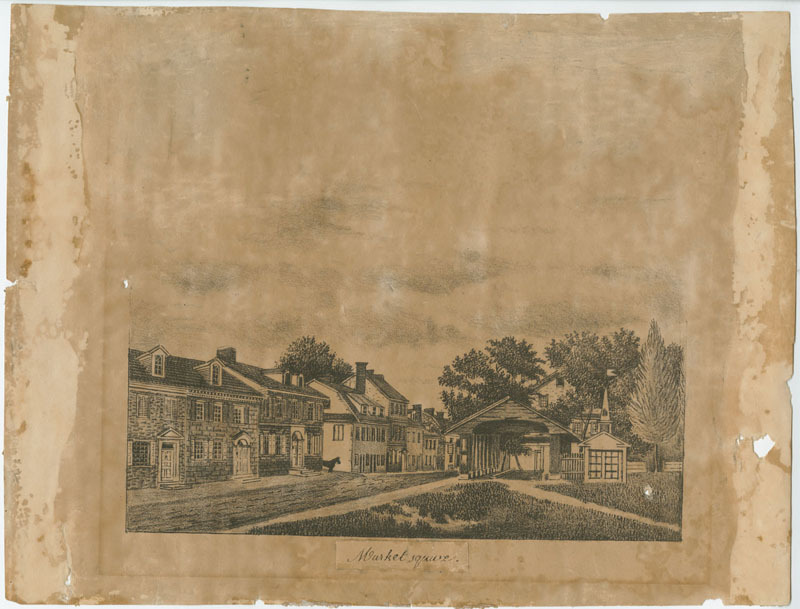 This print, later to appear in a series titled Quaint Old Germantown published in 1915 by Philadelphia antiquarian Julius F. Sasche (1842-1919), shows the dwellings of James Ashmead and the late George Bensell as well as the King of Prussia Inn. 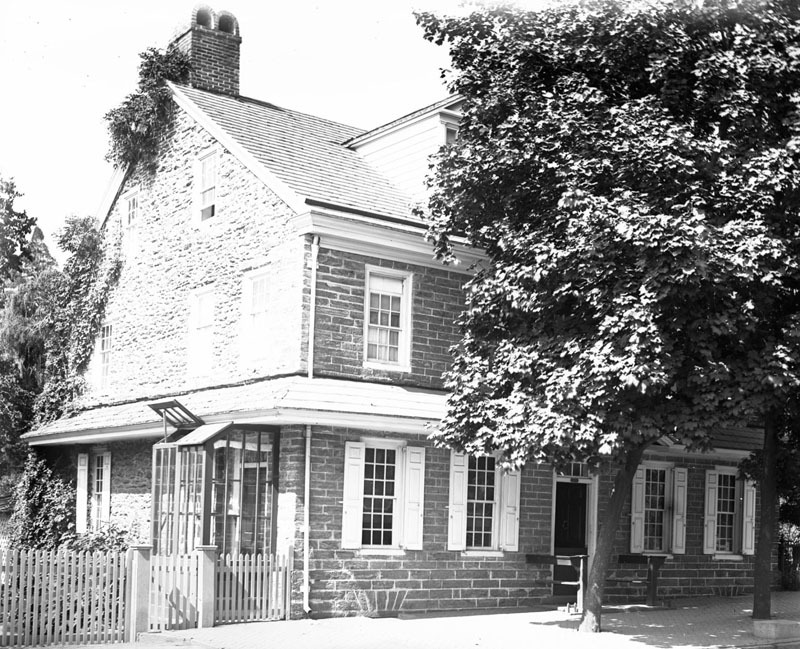 Around 1829, the year of the previously cited journal entry, Charles F. Ashmead occupied the inn for use as a store. F[rederick] De B[ourg] Richards. Pictorial Views of Houses & Places in Germantown yr 1859. Album of salted paper prints. Gift of Mrs. Charles Willing. The photographs of historic and prominent buildings comprising this album, originally commissioned by city historian and Germantown resident John Fanning Watson (1779-1860), also interested his fellow collector Ferdinand J. Dreer (1812-1902). The salted paper prints by the early Philadelphia photographer F. De B. Richards (1822-1903) duplicate the ones compiled for Watson. 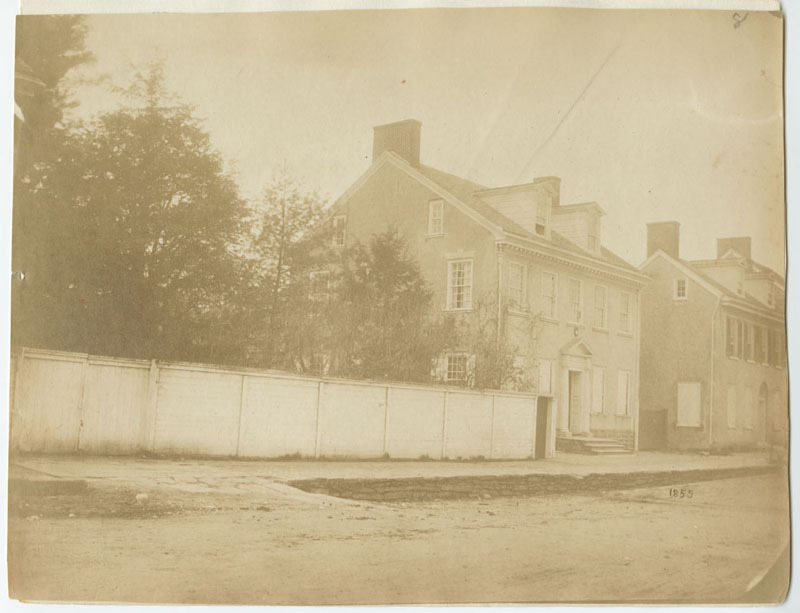 The twenty captioned views predominantly show residences located on Germantown Avenue, including the house at 5442 Germantown Avenue of Samuel Morris (1791-1859), later owned by his son Elliston. The Morris family owned the property from 1834 to 1948, when they donated it to the National Park Service. 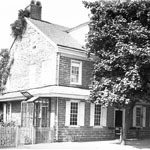 It is now known as the Deshler-Morris House or the Germantown White House because of its use as a residence by President George Washington during the yellow fever epidemic of 1793. Marriott C. Morris. Market Square & houses on E. side of it, from Bank pavement, School L[ane], April 18, 1885. Modern reproduction from glass-plate negative. Marriott C. Morris. Johnson House. Main opp. Washington Lane, September 17, 1883. Modern reproduction from glass-plate negative. 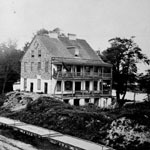 Marriot C Morris, the Quaker founder of the Germantown Boy’s Club, began his interest in photography during his years at Haverford College (1881-1885). Of the hundreds of the pictures he took during his first years experimenting with photography, many document his neighborhood. 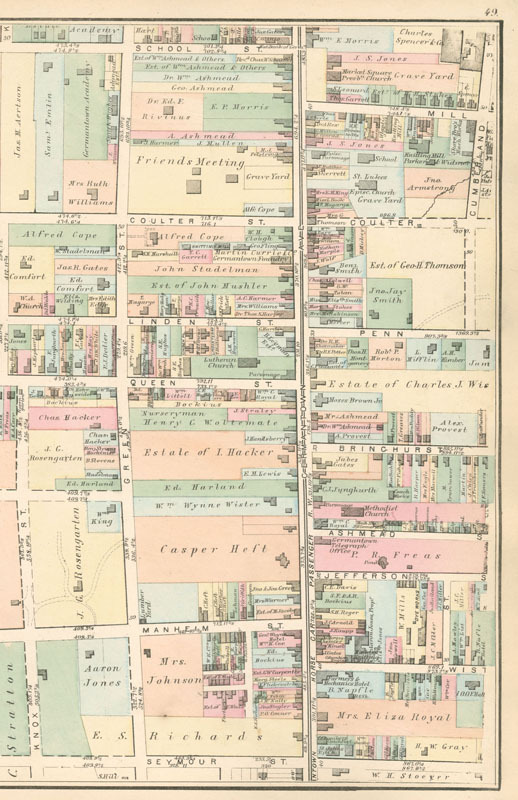 His family home, the Deshler-Morris House, stood not far from the Market Square (as seen in the ward atlas). 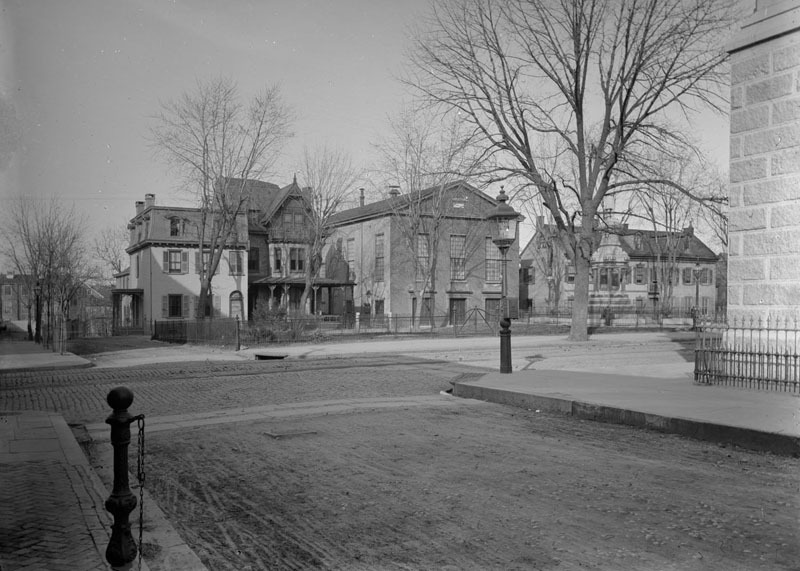 Many of the Germantown photographs taken by Morris depicted the blocks adjacent to his home, including these views of areas surveyed by Green almost fifty years earlier. John G. Bullock. Market Square showing two old houses. Monument to soldiers who fell in War of Rebellion. Erected 1883, ca. 1900. Modern reproduction from lantern slide. 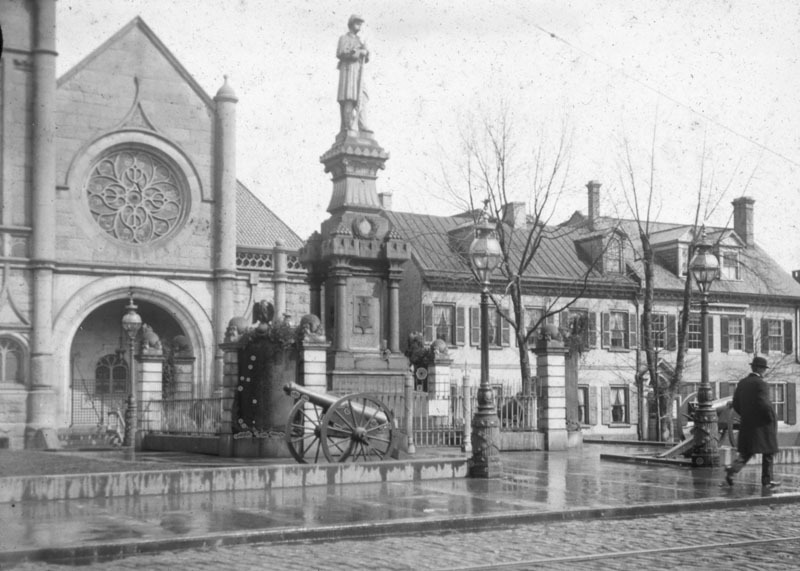 In the early 20th century, the Market Square continued to draw attention as a site to be captured visually for posterity. 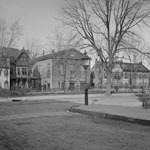 This view from a series of lantern slides photographed by amateur photographer and resident John G. Bullock (1854-1939) titled “Old Germantown” shows the block on the opposite side of the square the one depicted in the Green survey. 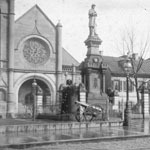 The image, probably used during a lecture by Bullock at the Philadelphia Photographic Society, of which he served as president, shows the Civil War monument commissioned by the members of Ellis Post, No. 6, Grand Army of the Republic. The Market Square Presbyterian Church, rebuilt in 1887 at 5507-5517 Germantown Avenue, stands in the background.